Round Cafeteria Table - Benches and Stools 60" dia. Get the best of both worlds when you purchase combination stool and bench cafeteria tables. 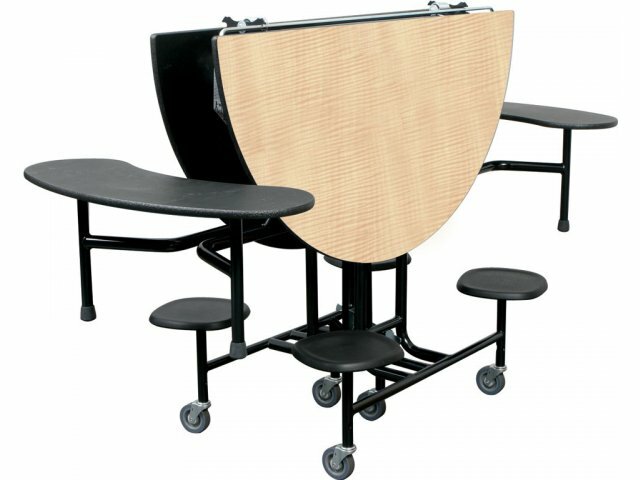 These round tables facilitate social interaction whether students choose to sit individually on stools or share a bench with their friends. Choosing the right cafeteria tables makes all the difference in lunchrooms and school cafeterias. 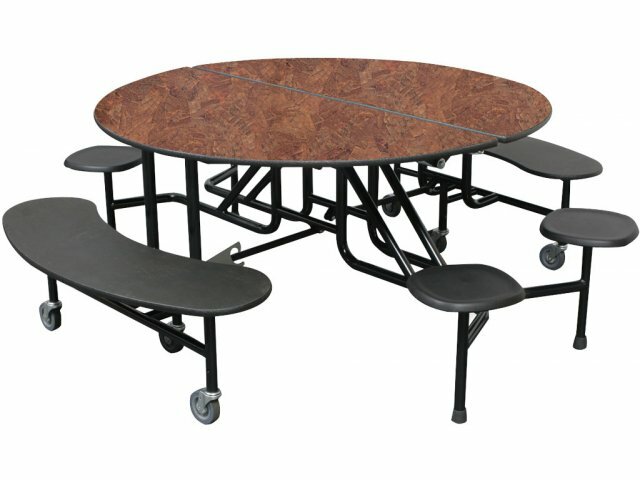 These Round Mobile Cafeteria Tables from Palmer-Hamilton are solidly built, extremely durable and easy to transport. A unique system of torsion bars and springs provides this table with a smooth, controlled lift-assist operation that won't strain your back. Two-stage center latches make it easy to lock them in place when in use or for storage without having to walk around the table. Non-marring Poly II casters roll smoothly and quietly, and are resistant to oil, water and most chemicals. With a choice of Wilsonart laminate tops and bright seat colors, these round cafeteria tables take any food court, cafeteria or lunchroom setting to the next level of quality and style. Seat Selection: A combination of stools and benches enables students to individually choose the seating option that they prefer. Easy Lifting: Torsion bars and springs combine to provide superior lift-assistance for no-strain setup. Even Weight Distribution: End leg assemblies with center wheel offer excellent weight distribution. Center-Locking: Two-stage latches are center-located — no need to walk around the table to lock it in place. No-Chip Edges: EdgeGuard treatment protects table edges from peeling and chipping, and provides super resistance to moisture, prevents unsightly food traps, and is highly tamper-resistant. Wilsonart Colors: These cafeteria tables can be ordered in any standard -60 or -38 series Wilsonart laminate color at no extra charge. Made to Order: These tables are custom made, and are therefore non-cancelable and not returnable. 5 minutes per stool or bench.